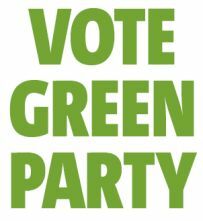 Once again it is local Council election time and everyone in Tameside has the opportunity to vote for a Green Party Candidate. Please choose to vote Green Party for progressive change ‘For the Common Good’. Polling Day will be on Thursday 22nd May and the polls will be open from 7.00 am until 10.00 pm. Please check from the following list who is the Green Party Candidate for your ward in the Tameside Council elections. Don’t forget that there are also European Parliamentary elections being held on the same day, so you will have two votes and you will also be able to vote for Green Party Candidates for Europe. This entry was posted in Campaigns, Tameside Green Party and tagged Ashton Hurst - Charlotte Hughes, Ashton Saint Michaels - Nigel Rolland, Audenshaw - Nancy Jaeger, Denton North East - Gerard Boyd, Denton South - Mike Smee, Denton West - Jacintha Manchester, Droylsden East - Mark Stanley, Droylsden West - Joanna Jaeger-Booth, Dukinfield - Julie Wood, Dukinfield/Stalybridge - Emily Kelly, Green Party Candidate, Green Party Candidates, Green Party Candidates for Europe., Hyde Godley - Nick Coopman, Hyde Newton - Andrew Highton, Hyde Werneth - Melanie Roberts, local Council election, Longdendale - John Kelly, Mossley - Christine Clark, St Peters - Trevor Clarke, Stalybridge North - Jean Smee .Ashton Waterloo - Andrew Threlfall, Stalybridge South - Mo Ramzen, Tameside Council elections, Tameside Wards by tamesidegreens. Bookmark the permalink.